Nearly a million postcards containing random strangers' mailed-in confessions have been collected for an exhibit at the National Postal Museum. The PostSecret website, which initially posted many of the missives, was an online phenomenon. WASHINGTON — For years, thousands of postcards containing random strangers’ deepest, darkest secrets kept showing up in the mail at the nondescript suburban house on Copper Ridge Road, in Germantown, Maryland. The postcards, initially just a few dozen, were part of what former D.C.-area denizen Frank Warren thought of as a community art project. But the mailed-in confessions, which Warren posted on his “PostSecret” website starting in 2004, became an online phenomenon in the pre-Facebook days of the web and went on to fill six best-selling books. Nearly the entire collection of messages — more than a million postcards — have now been collected for an exhibit at the National Postal Museum, on display through September 2017. For Warren, who moved to California last year and has returned to D.C. for an event Friday at the museum, the exhibit of postcard confessions is a homecoming of sorts. “It’s so exciting to see them kind of find a home there, not far from where the project started,” Warren told WTOP. One postcard mailed in 2013 appeared to contain a murder confession, although police later determined it was a hoax. Still longing to get something off your chest? You can still send in your postcard to the same Germantown address Warren has used for the past decade: 13345 Copper Ridge Rd. (The house is now on the market, but Warren said he still has a great relationship with the Postal Service, which continues to forward the missives to the West Coast). During PostSecret’s heyday, when hundreds of postcards were showing up on his doorstep every week, Warren said he dismissed setting up an anonymous P.O. box. What has Warren learned after a decade reading people’s most guarded secrets? 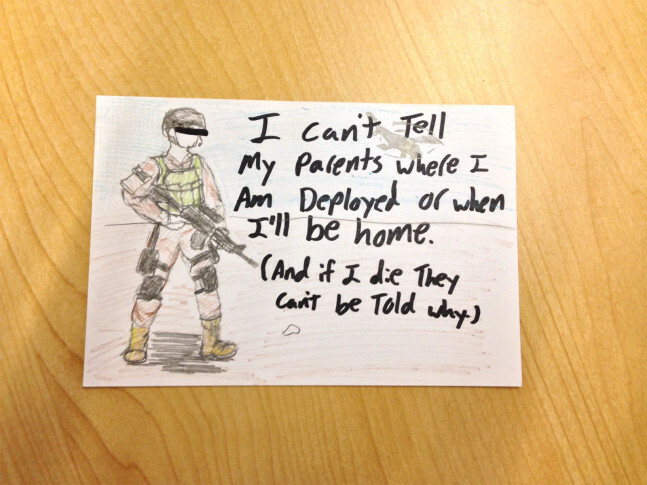 “PostSecret: The Power of a Postcard” exhibit runs through September 2017 at the National Postal Museum. Warren will speak about the collection Friday during an appearance at the museum for a Smithsonian at 8 event at 7 p.m. VIP tickets to attend the conversation are $40 at the door.